A new survey released today by TriNet (NYSE: TNET), a leading cloud-based provider of HR services, underscores the importance of generous paid time off (PTO) packages for employee satisfaction. 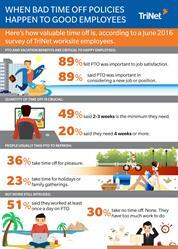 The TriNet survey gauged the impact of various PTO benefits on workers' behaviors and their job performance. (1) The survey found that employees consider PTO a very important part of their job satisfaction. It also found that nearly one-third of employees mainly take time off for medical emergencies, family obligations or personal obligations. Employees who take time off for these reasons earn, on average, $22,000 less per year than those who mainly take time off for pleasure. (2) Finally, the survey showed that older workers expect more time off than their younger colleagues. "If employers are serious about attracting and retaining talented employees, they need to provide competitive paid time off packages that work for multiple generations and diverse personal priorities. Setting a PTO policy that meets the needs of employees doesn't just help reduce costly employee turnover. It is imperative for maintaining company morale and ensuring your employees feel happy, energized and able to perform to the best of their abilities. This has a direct positive impact on your business's bottom line." (1) Survey conducted by TriNet between June 2-7, 2016, with 666 people responding. Respondents are all worksite employees of TriNet clients. (2) Respondents who take time off for pleasure earn $76,000 per year on average; respondents who take time off for medical necessities, family emergencies or personal obligations earn $54,000 per year on average. (3) Source: Bureau of Labor Statistics, 2015, Series ID: ENUUS00050010. http://www.bls.gov/cew/home.htm. (4) Source: the Center for Economic and Policy Research, 2013. A June 2016 survey of TriNet worksite employees found that paid time off is a valuable employee benefit.